Yesterday we ran correlations between various pitching metrics and fantasy baseball profits for pitchers, and found that most of the ways we evaluate pitchers—like strikeouts and ERA—influence a pitcher’s cost so much that they don’t help us predict profits. But we did discover that a pitcher’s walk rate wasn’t fully incorporated into his price, and that pitchers with better walk rates tended to earn more fantasy profits. We also found that the component ERA estimators, xFIP and SIERA seemed to have some correlation to profits for pitchers with 100-161 inning pitched the previous year (even though they didn’t correlate to profits for the more established group of pitchers who qualified for the ERA title the preceding year). Now, this finding is a tenuous one, for now at least, because I’ve only run the correlation for 2013 stats leading to 2014 outcomes. This is a group of 55 pitchers, and I’m sure that a cluster of outliers for that year could have affected the results. But bear with me, because cobbling together another year’s worth of correlations will take some time, and a look at the pitchers who bubble up to the top of the SIERA list promises to be way more fun. But first, let’s address what SIERA and FIP are. SIERA is an ERA simulator. The acronym is Skills-interactive Earned Run Average. ERA, as everyone knows, is a measure of how many earned runs a pitchers allow per nine innings. FIP (Fielding Independent Pitching) is a simulator that ignores balls in play, while SIERA includes information about the numbers and types of ground balls, fly balls, line drives and other hit types, to fine tune FIP. The end result, it is hoped, better reflects how a pitcher actually pitched, by stripping out some of the random variation that may have occurred. The number is on the same scale as ERA, so a SIERA of less than 3.00 is really good. 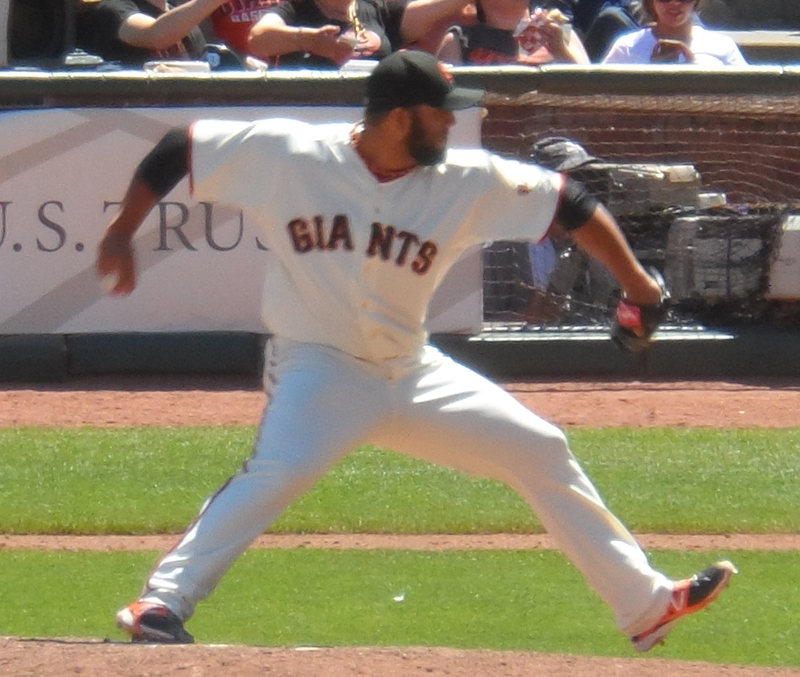 Yusmeiro Petit: Since landing in San Francisco he’s added a cutter and suddenly stopped allowing a ridiculous number of home runs. He made 12 starts last year and will not be in the rotation going into this season. His mediocre ERA last year, and his lack of a fantasy-meaningful role this year mean he should come cheap, which is the way you want him. But there is a good chance at a meaningful number of productive innings, with a lot of strikeouts, even if he doesn’t crack the rotation the way he did last year. Carlos Carrasco: His incredibly hot finish last season, after adding a slider and coming back from TJ, have this former top prospect topping sleeper lists, which could be a problem. He deserves to be there, but if his price goes up too much you lose the potential profits. And, of course, success for any pitcher isn’t guaranteed. Masahiro Tanaka: Nobody’s idea of a sleeper, he makes this list because of the partially torn UCL he suffered last July. He chose not to have TJ and is throwing this spring without pain. So far so good, but he’s a potential time bomb. If he makes it through spring training he’s going to attract bidders, but every dollar spent on him is at risk. Jake Arrieta: Like Carrasco, his profile rose last year because of a fantastic finish. That has the regression police on the prowl, and it should be mentioned that unlike Petit, Carrasco and Tanaka, he walks guys. But far fewer last year than in the past, and it was this that really changed his profile. If fears of regression knock his price down enough he’s a fine target. Yu Darvish: Darvish missed the last two months of the season with elbow inflammation, but wasn’t all that effective before that. Like Tanaka, the upside is potentially large, but the prospect of a season-ending injury at any time will remain no matter how good he looks this spring. Plus, his issues with bases on balls are another potential problem for him, even if he manages to stay healthy. T.J. House: Another guy with a solid second half, good control, and a new pitch, an improved change up, without a lock on a rotation slot. In mixed fantasy leagues he’s a potential reserve, but in AL only he should be a sneaky endgame swing man with a lot of potential if a rotation slot opens up. He hasn’t show the strikeout punch the other guys on this list have, which is another reason he’s likely to go very cheaply. Collin McHugh: Like Arrieta, he was a surprise top earner last year, and his breaking pitches were impressive enough that his price could soar. In which case, you’re probably best advised to stay away. The next group of pitchers between 100 and 161 IP, ranked by SIERA, has some overlap with the low walk rate list: Hyun-Jin Ryu, Marcus Stroman, Jacob deGrom, Matt Shoemaker, Gerrit Cole, Josh Tomlin, Danny Salazar, Gio Gonzalez, Homer Bailey, and Anibal Sanchez. Hardly sleepers, most of them, but names to keep an eye on, for sure. This entry was posted in Data, Math, Prices, Projections. Bookmark the permalink.